The Riekes Center now hosts corporate events! Skip the bowling alley and join the Riekes Center for authentic team-building experiences that are both engaging and effective. We craft unforgettable experiences for your team. We also have unconventional meeting spaces for holding private meetings. Events are as short as one hour, an all day extravaganza, or overnight excursions. We can also include food, beverage and private meeting rooms. Increase focus as coworkers compete to hit the target. This session pushes the mental edge as it discusses mechanics and proper technique in archery. In this one of a kind crash course on playing music in a group you will learn cooperation, listening and nonverbal communication skills. Regardless of the individual or groups prior musical experience, our expert instructors and their dynamic hands on approach will have your band rocking out their favorite song in no time. Market yourself – take high quality selfies and better pictures of your cat! This workshop covers the fundamentals of photography: composition, exposure, and lighting through a series of activities. We also offer professional headshots and corporate team photos. Are available with additional costs. Headshots and Team photos must be scheduled in advance. Please let us know if you would like to see examples. Spoken Word Improv builds confidence and public speaking skills while exploring the rhythmic patterning of words, making beats and writing rhymes. This session gets participants out of their comfort zones, taking creative risks, all the while building confidence for public speaking and performance. Relax your mind and spend time outdoors learning new techniques for nature observation. This session explores local plants and wildlife and incorporates hands on activities like willow basket making, creating primitive utensils and more. Learn exercise fundamentals for lifetime wellness. In this session participants can get a baseline assessment of their current physical fitness level, create a lunchtime workout routine, and set goals for future health. Take a break from the desk and find your inner child. Build camaraderie as you compete with your coworkers in a series of active games. 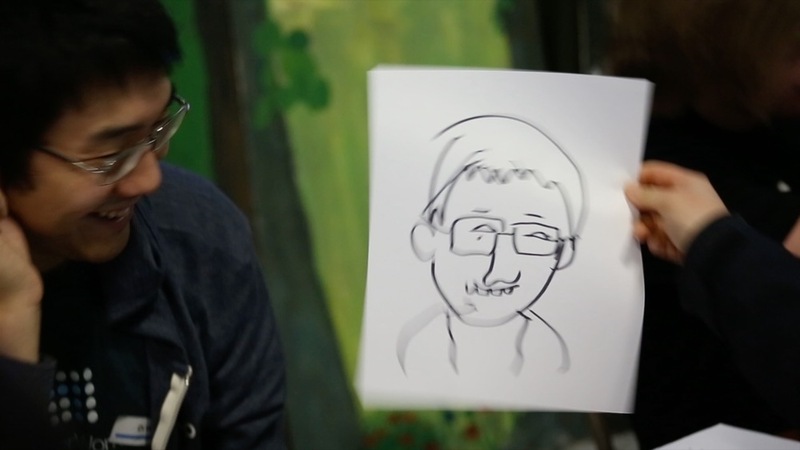 Unleash your inner 6 year old as you paint and draw portraits of your co-workers in teams and individually. Each person paints a piece of the puzzle and your group will end up with a mural that represents the team. Take it back to office or display it in your companies lobby for all to see! Participate in guided exercises that reduce stress and relax the mind through body movement. This session contains valuable breathing techniques and activities to give you a mental reset and help you and your team face the fast pace of Silicon Valley. If you are looking for an outdoor adventure or wilderness experience, we can shape custom day and overnight programs to fit your needs. Past programs we’ve done include: team building at the beach, hiking, and camping. Looking for a place to volunteer as a team? There are many opportunities at the Riekes Center working with our Community Service Department. Partner up with teen volunteers and engage in a variety of activities all the while helping them build leadership skills. We also appreciate volunteers who are interested in one-day projects and strategic problem solving. Get your group marching to the beat of one drum. Explore the different ways people hear, feel, and react as they test their coordination and rhythm. An excellent way to build listening skills and camaraderie. Get motivated and inspired by Gary Riekes as he shares vision, philosophy, and stories of his life experience in professional football, running a nonprofit in Silicon Valley, and working with thousands of athletes, musicians, artists, and nature experts from around the world. Wifi signal out? Long line at the bathroom? Zombie apocalypse? Learn what it take to be prepared for any situation. Learn how to make fire by friction, rope from natural materials, camouflage and more. Don't see what you are looking for? We have endless possibilities. The Riekes Center features multiple rooms, state of the art equipment and technology. Our staff comprises of skilled individuals coming from a variety of disciplines, all of whom have extensive experience with program and curriculum design. We can develop custom games and activities to meet your organizations needs & goals. Pricing varies according to the your groups needs and goals.